In our annual year in review article, PalmInfocenter takes a look at all of the major events that took place in the Palm world over the past 12 months. 2007 was a year of alternation and change to come in the world of Palm. After riding on a wave of Treo popularity in 2006, the year saw increased competition, internal discomposure and corporate recapitalizations. Read on for our look back at the Palm Economy in 2007. Palm started the year by bringing the Treo 750 to the US. 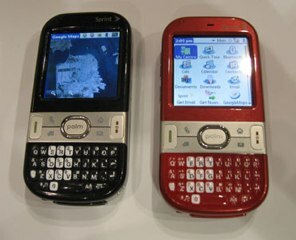 Previously available in Europe and Asia as the Treo 750v, Palm announced the Cingular Treo 750 at CES 2006. Research group NPD released a report that stated smartphone sales were on the rise and listed the Treo 650 and 700p among the top five sellers in the US for '06. In Palm device news, the Treo 680 was released around the world, while the LifeDrive faded out of existence. The mobile industry would never be the same following Apple's groundbreaking iPhone announcement in early January. The company formerly known as PalmSource fufulliled its contractual obligations to discontinue use of the Palm trademark. ACCESS decreed that its "Palm OS" property would hereinafter be known as "Garnet OS". February started off with the first beta release of SlingPlayer for Palm OS devices. MobileInfocenter launched a new Mobile Linux site. Windows Mobile 6 was announced by Microsoft, with Palm announcing its intentions to release a WM6 device. The other big news items from the month were more details and official screenshots of the Access Linux Platform. Palm released a new GPS Kit, the GPS Navigator Smartphone Edition. Verizon picked up the Treo 700wx. In the begining of March a chorus of buyout and takeover rumors sent Palm's stock higher. Meanwhile, Palm announced the official opening of a new Pacific R&D and Operations center in Shanghai, China. The NYTimes published a piece on Palm's latest hire at the time, Paul Mercer, a former Apple engineer who would be tasked with helping Palm "respond to the iPhone." In April Palm CEO Ed Colligan came out in an interview to downplay the rampant takeover rumors stating he was focused on operating Palm as a stand-alone business. Shortly thereafter Palm announced the first details of its new Linux based Mobile platform, which would later turn out to be the underlying OS on the Foleo product. It was in this month that Palm opened its official company blog. The site was quickly flooded with a ton of complaints from Treo 700p users asking for an explanation for the long delayed rom update. The Treo 755p was launched on Sprint in May, marking the first new Palm OS Treo of '07. Palm would also announce a new Bluetooth keyboard. Late May saw the hyped and long-hinted at debut of the Palm Foleo. Palm OS fans and the tech press in general were quick to question and bash the device, while Palm founder and Inventor Jeff Hawkins would call it "the best idea he ever had." June saw the end of the takeover rumors and the official announcement of a recapitalization deal with Bono-backed Elevation Partners. The deal involved Elevation taking a 25% stake in Palm, while investors got a $9 equity payout per share. It would also bring in much need new management to Palm in the form of former Apple Execs Fred Anderson and Jon Rubinstein. It also marked the end of the long reign of Chairman Eric Benhamou on Palm's board. Shortly after the deal was announced word came out that Palm had a round of layoffs. Roughly around 100 people were let go in order to "eliminate some of the hierarchy." During the quaterly conference call late in the month, CEO Ed Colligan expressed confidence and optimism in the Foleo line, despite the mixed reviews from industry 'pundits'. July saw the iPhone debut to rabid fans who camped out in lines for the device. Tim posted a editorial comparing it with the Treo line which aroused a lot of debate. Other than the release of the Palm Desktop for Vista and a couple of early Centro and Verizon 755p rumors it was a typical quiet summer month. August saw another round of screenshots, yet still no licensees or devices, of ALP in action. Foleo anticipation continued to build with rumors of release dates and hands on videos. Meanwhile third party companies continued to make Foleo software announcements in advance of its release. Later in the month Engadget published its now infamous "Palm Intervention" article. While Palm continued to stick to its original Foleo release plans denying reports of delays. September got underway with the bombshell that the Foleo would be "cancelled in its current configuration." Ed Colligan posted a letter on the Palm blog explaining his reasoning and the decision to not bring the Foleo to market. He cited the costs and commitments of supporting another platform, while Palm was already underway working on another separate Linux based platform for its next generation smartphones. Palm would have two new product announcements this month that would end up shipping. The Treo 500v running Windows Mobile smartphone edition was announced for Europe via Vodafone. The Treo 500 marked the beginning of Palm's entry into the Windows Mobile ODM rebranding market, as it lacked any of the usual software or hardware customizations Palm has been known for. The latest and last new device to debut in 2007 was the Palm Centro on Sprint. The Centro marked the first major new form factor and design for a Palm branded smartphone since the Treo 600 in 2003. Besides the sleeker profile, the Centro is also notable for its low $99 debut price witch has helped fuel its early success. In October Palm reported its first net loss in more than three years of $841,000. Sales of Palm smartphones slowed during the current quarter, down around 9% from the previous record setting Q4 FY07 quarter. Colligan would talk up the progress on the next generation linux-based operating system during the conference call. He went on to state that Palm is not ceding the high end of the smartphone market to anybody, and that the next generation device will deliver more revolutionary device types. PIC published our Palm Centro review, as the device received early praise and encouraging sales. Palm wrapped up the month by releasing its 3rd generation Bluetooth headset. In early November Google made public their mobile plans, announcing the Android OS and the Open Handset Alliance. Palm would go on record to state that they had no plans to join the effort or adopt Google's new mobile linux based OS. In the PDA world, yet another new report stated the obvious, that handheld sales have declined due to convergence and manufacturer disinterest. Meanwhile smartphone sales were predicted to continue to grow at double digits over the next five years. 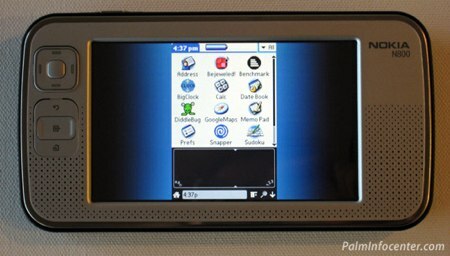 ACCESS made some headline news by releasing a Palm OS Garnet VM for the Nokia Internet tablet series. The software allows Linux based Nokia tablets to run native Palm OS applications in a virtual environment. You can checkout more in our photo gallery and video demo. One of the oldest and largest Palm OS only software sites, PalmGear, shut down this month. Its current owner Motricity decided to close the domain and transition its customers to its multi-platform PocketGear site. In the process the site removed thousands of classic Palm OS titles and all freeware from its catalogue. December saw the launch of a new mobile portal for smartphones, PhoneFavs, from MobileInfocenter. The site offers mobile device users a number of tools to enhance their mobile web surfing experience including a bookmarking service, a mobilizer and a mobile site directory. Google announced a new pseudo-GPS location service in Google Maps, which initially is not compatible with Palm OS devices. Palm promised future compatibility with a rom update for select devices. The Palm Centro continued to earn praise being rated the "most appealing mobile handset design" and gracing the cover of Consumer Reports magazine. Palm would see its second round of job cuts this month, announcing "hundreds" of layoffs. Palm would later announce a loss of $9.6 million for the quarter and issued warnings of rough spots ahead. In the conference call Colligan said that 2008 will continue to see new Palm OS and Windows Mobile based product introductions. He confirmed that new Treo's based on Windows Mobile are in the works as well as the global launch of the Palm Centro. 2007 was a year of many ups and downs for Palm Inc. The company came into the year riding high on a wave of rising Treo popularity and anticipation for Hawkins new mystery device. Yet with the introduction of the iPhone, increasing BlackBerry sales and a plethora of sleeker Windows Mobile smartphones, Palm's models suddenly faced a new wave of fierce competition. Palm started the year out profitable for the past three years, only to end with losses and declining sales in the later quarters. The company itself has acknowledged this transitionary period as it made abrupt reductions to solely focus on its goal of developing a next generation platform for future products. From the quick rise and fall of the Foleo to the introduction and early popularity of the Centro, this year has been a wild ride for Palm. WIth new leadership and a self-stated sharp focus on its long term vision, Palm certainly has an uphill battle ahead of it. You may also enjoy reading our most popular stories of 2007 article. I think that Mr. Mercer would prefer to be not called Palm. Either that or he'd have needed a lot of therapy. Unfortunately, it's probably not the nadir. 2007 was not a good year for Palm. The 700p issues, the Foleo debacle (one of the worst product launches I've ever seen in my short time observing the computer industry) and increasing market indifference to the classic Treo design saw them slip behind by almost every measure, especially when compared to the growth of the smartphone market as a whole. 1) Palm have a hit device in the Centro, but a big reason for that is that they're practically giving them away at $99. It can't be expected to revive their financial fortunes, although it should revive their consumer mindshare a little. 2) Other companies are finally catching up on the software interface side. WinMob 6.1, for instance, will have threaded messaging and an interface revamp. And we all know just how close to the bulls-eye that the iPhone has gotten. RIM are no doubt working on making the Blackberry interface better too. In short, the simplicity and user-friendliness of Palm OS will no longer be as big an advantage as it was in the past. 3) Increasing numbers of disillusioned fans are going to continue their exodus to other platforms out of despair at the lack of new, large-screened devices and the longer they stay there and build up a nest the harder it's going to be to bring them back into the fold. Once Apple release the iPhone SDK and people start to personalise them, that's a massively powerful incentive for them to stick with Steve. And of course, many former Palm OS advocates have already made comfy homes in Windows Mobile. 4) The Foleo's window of opportunity to make a big splash will close, as Asus improves the Eee and releases non-hobbit-sized models and other devices like the Cloudbook establish themselves - not to mention Apple's likely upcoming entry into the subnotebook sector. By the time 2009 rolls around and Palm finally have their new Nova platform in place, it will quite possibly be too late for the Foleo II to make any sort of meaningful impact. In short: in past years, the storm clouds on the horizon. Now they're directly overhead and Palm doesn't have an umbrella. It'll be a wet 12 months. RE: Unfortunately, it's probably not the nadir. If PALM can REALLY REALLY get their act together and make their pan-device Linux-based operating system WORK with nonPALM devices and allow total cooperation between devices when they're "close" and stand-alone operation when they're apart, then PALM has a good chance of sustaining itself. I don't think they can do it, but there IS the possibility! And I =do= think the competition is fully aware of what PALM is doing so can EASILY match and exceed everything they can come up with. If they want to. When they want to. But it IS a possibility! BTW - PALM is/was looking for (IBM) WebSphere (*) folk(s). Jumping to an almost-totally-baseless conclusion from that little factoid, it COULD be possible they're thinking along the line of server-based applications (like iPhone's Visual Voicemail) to differentiate their future devices from the crowd. (*) Seems somewhat of a giggle given that one of their BoD members, Bill Coleman, was the CEO of BEAS and oversaw the development of the WebLogic application server. Not good enuf, huh? Good post, SV. I've LONG maintained that the MyPalm (perpetual) beta portal is just the tip of the iceberg and Palm is going to try and rely on a LOT of server-side apps/services/enhacements/distinguishing features to separate their otherwise vanilla hardware from the competition. It's a lot easier to offer up some software customizations and online portal-type custom functionality than it is to tweak a variety of different handheld formfactors (landscape tablet, portrait tablet, clamshell, classic QWERTY Treo style, subnotebook etc ) against increasingly Apple, RIM, the fierce Asian ODMs such as HTC, Asus, Acer etc and the traditional mobile giants (Samsung, Nokia, Moto, Sony-Ericsson etc). Palm's value has always been in its unique software. It's certainly why I'm still using a Treo. I just think that this year, us users are going to be feeling the pain of sticking with Garnet more than ever and if Palm remain as secretive about Nova as they have in the past it'll be a looooong wait for 2009 - especially with so many tempting gadgets from other companies beckoning to us with a sultry look in their eye and a leather lash in their hand. Where are Mike Cane's predictions for 2008? His annual predictions used to be a regular article here. Where are Ardiri and Cervezas? We need comments and insight on POS II. What the hell is there to predict anymore? Treos have as much interest to me as getting a dose of clap! PALM's Management Team web page shows they've finally acknowledged that they hired a new SVP for...uh...maybe...Product Development last month (if various SEC Form filings are to be believed w.r.t. when they need to be filed). Only problem is PALM doesn't say he's in charge of product development, instead still saying that Rubinstein is. Instead, he's in charge of product realization. No, I don't know what that means. Unfortunately, no supporting information nor link has yet been posted. Anyone wanna confirm with more info? I'd personally been waiting for this to happen for, oh, a year or longer. I was recently in a few airport stores and noticed that they were in total disarray and the sales staff were oddly unenthusiastic about trying to peddle any of their wares. To top it off, I didn't even see a full selection of Palm-branded accessories. None of the newer BT headsets, GPS kits or cases were in stock, oddly enough. Ryan also commented that he went to the Palm store on his way back from holiday travels and they had non-Palm merchandise being displayed on a Palm-branded display case!?! With Palm about to EOL their final PDAs, CompUSA closing up shop, Office Depot very rapidly dropping everything Palm-related, and other stores scaling back their efforts, what's the point of offering anything other than spare batteries & styli in the carrier stores? Apple has enough compelling product to have a sizable retail chain of their own. Palm is in constant belt-tightening mode and never had any business being in the retail/kiosk business. They SHOULD have used all of those dollars they wasted on retail (Hello! Rockefeller Center flagship store, anyone?) at developing new non-smartphone product (ie a better Fooleo, new PDAs) that could be sold through their existing retail chain partners (Staples,OM, OD, BB etc). Well, if true it certainly dashes my thoughts on how long that NYC lease was for! Does anyone (SV etc) even know if Palm even has the master leases for those retail spaces directly? I was under the impression that some "generic" cell phone merchant like Wireless Concepts operates & staffs the store and Palm just pays them $ X each month for their "Palm" branding/fixtures/prominent displays. The staff at those stores (at least the airport ones I've been to that sell other stuff--I've never been in a Palm-exclusive kiosk or store) certainly don't do much in the way to evangelize or promote or even be well-informed on all things Palm! If that is true then it might be relevant to bring up again that GSIC purportedly laid off 100 PALM support staff (there'sa t least one other post around here by me noting that) - and somewhere I read that those support folks were NOT simply SUPPORT folks but retail sales folks as well or in toto. So if PALM is REALLY cutting back on such entities there may be more unannounced nonPALM-but-PALM layoffs announced soon. Apple has enough compelling product to have a sizable retail chain of their own. Like Apple's new thin portable computer? Doesn't Jobs holding this thing remind you of Hawkins holding the Foleo? RE: Was PALM closing stores? Now Apple notebooks! I would think that thin (thin!) notebook would be uncomfortable to carry. You know, I *still* haven't been there.